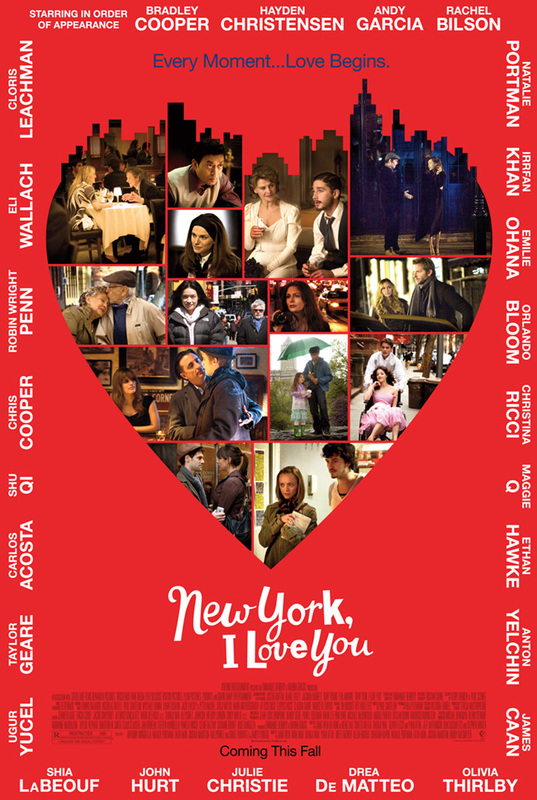 CHICAGO – In our latest romance/drama edition of HollywoodChicago.com Hookup: Film, we have 35 admit-two passes up for grabs to the Chicago screening of the new film “New York, I Love You” from an eclectic group of some of today’s most imaginative filmmakers. This film also features a powerhouse of today’s hottest stars! “New York, I Love You” stars Bradley Cooper, Justin Bartha, Andy Garcia, Hayden Christensen, Rachel Bilson, Natalie Portman, Irrfan Khan, Emilie Ohana, Orlando Bloom, Christina Ricci, Maggie Q, Ethan Hawke, Anton Yelchin, James Caan, Olivia Thilrlby, Blake Lively, Drea de Matteo, Julie Christie, John Hurt, Shia LaBeouf, Ugur Yucel, Taylor Geare, Carlos Acosta, Jacinda Barrett, Shu Qi, Burt Young, Chris Cooper, Robin Wright Penn, Eva Ammuri, Eli Wallach and Cloris Leachman. The film is directed by Natalie Portman, Fatih Akin, Yvan Attal, Allen Hughes, Shunji Iwai, Wen Jiang, Shekhar Kapur, Joshua Marston, Mira Nair, Brett Ratner and Randall Balsmeyer. To win your free pass to the advance Chicago screening of “New York, I Love You” courtesy of HollywoodChicago.com, all you need to do is answer our question below. That’s it! This screening will be held on Tuesday, Oct. 13, 2009 at 7 p.m. in Chicago. Directions to enter this Hookup and immediately win can be found beneath the graphic below. “New York, I Love You” stars a powerhouse cast including Andy Garcia, Hayden Christensen, Rachel Bilson, Natalie Portman, Orlando Bloom, Christina Ricci, Maggie Q, Ethan Hawke, Anton Yelchin, James Caan, Olivia Thilrlby, Julie Christie, John Hurt, Shia LaBeouf, Chris Cooper, Robin Wright Penn and more. Directed by an eclectic group of some of today’s most imaginative filmmakers (including Jian Wen, Mira Nair, Shunji Iwai, Yvan Attal, Brett Ratner, Allen Hughes, Shekhar Khapur, Natalie Portman, Fatih Akin, Joshua Marston and Randy Balsmyer), “New York, I Love You,” invites audiences into the intimate lives of New Yorkers as they grapple with, delight in and search for love. In the Diamond District, an intercultural romantic fantasy transforms the purchase of a precious stone. Meanwhile in Chinatown, a desperate artist pursues a reluctant muse. Within an Upper East Side hotel, a sophisticated guest and a mysterious bellboy journey outside of time. After an unexpected night in Central Park, a young man’s prom date has a surprising revelation. Traveling toward the Village, two lovers speed by taxi, subway and foot to meet for the first time after what they thought was a one-night stand. In Tribeca, a pickpocket finds the tables turned when he follows an alluring girl. In Brooklyn, a moment of Coney Island bliss envelops an octogenarian couple. These stories and more are all woven together to form a colorful and lyrical collage not only of the city but of the deep yearning for love and human connections that sustain everyone within it. Bringing to life the film’s host of unforgettable New York characters is an all-star cast that includes Bradley Cooper, Justin Bartha, Andy Garcia, Hayden Christensen, Rachel Bilson, Natalie Portman, Irrfan Khan, Emilie Ohana, Orlando Bloom, Christina Ricci, Maggie Q, Ethan Hawke, Anton Yelchin, James Caan, Olivia Thilrlby, Blake Lively, Drea de Matteo, Julie Christie, John Hurt, Shia LaBeouf, Ugur Yucel, Taylor Geare, Carlos Acosta, Jacinda Barrett, Shu Qi, Burt Young, Chris Cooper, Robin Wright Penn, Eva Ammuri, Eli Wallach and Cloris Leachman. Following on the heels of the acclaimed “Paris, je t’aime,” the project is the second in a series of “cities of love” movies conceived by Emmanuel Benbihy who produced this film with Marina Grasic of “Crash”. The “New York, I Love You” movie trailer can be watched now below. What do you strongly love or dislike about New York? Like all Hookups here, this HollywoodChicago.com Hookup is simple: Just submit your comment below and we will award 35 people randomly via e-mail for our “New York, I Love You” Hookup. Winners needs to arrive early as seats are consumed on a first-come, first-served basis. Good luck! Submitted by g on October 4, 2009 - 8:43pm. I love the new song about New York by Jay Z, Empire State of Mind featuring Alicia Keys. OMG! Submitted by N (not verified) on October 4, 2009 - 8:49pm. New York City is crowded and dirty, but the world seems to be in NY. While it is not perfect, New York is comfortable and real and a home to many. Submitted by tracy on October 4, 2009 - 8:57pm. Lotta love in New York!!!! Submitted by goodscot on October 6, 2009 - 9:07pm. Looks like a great movie. Would love free tickets. Submitted by David Smith on October 4, 2009 - 8:59pm. Submitted by duyr0x on October 4, 2009 - 8:59pm. Submitted by kam on October 4, 2009 - 9:01pm. Submitted by amirdre on October 4, 2009 - 9:02pm. I love the people of NY. Submitted by A. Jones (not verified) on October 4, 2009 - 9:03pm. I love the people of NY. Though most folks say that they are the rudest on earth, whenever I go I’m greeting with love. Submitted by Anonymous (not verified) on October 4, 2009 - 9:04pm. I love the shopping in NYC!! !